Innocent, Jesus, you were judged guilty and condemned to death. 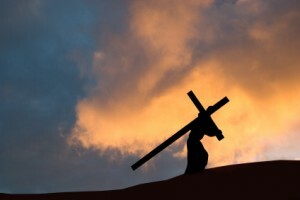 Uncomplaining, You received, accepted, and embraced Your cross. You fell under the cross You had chosen, but you stood up, supporting it, to be with your Mother Mary, to feel her love. Simon helped you carry it and Veronica comforted You as You suffered. Then You fell, but, staggering under Your cross, You chose to rise up to console the women along the way. You fell again, but, knowing what was to happen, welcoming it, You chose to arise and be stripped and nailed to Your cross. Hanging on Your cross, You chose, chose freely, to die for me and for everyone. Your dead body was lowered from Your cross into your Mother’s arms and then taken and buried. Then You chose to arise one last time, for me and for everyone. Jesus, help me rise up with my cross, help me arise for others. Amen.